I usually always cut the carrots and cabbage and freeze them, but this time i bought the fine julienne cut carrots and cabbage bag, they were so fresh and organic and I was so happy to find them because I just needed these two Veggies. They were very soft and fresh at the time of serving. 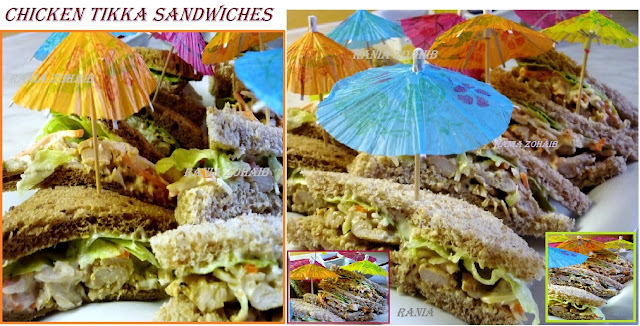 Enjoy making them, they are cold sandwiches and taste really good. You can surely increase the spices to your choice, but they should not be hot or else you won’t feel the delicious combination of coleslaw and chicken! Where did you put the carrot? Is it necessary? It gives me tummy aches :( And what do you mean by " white bread with sunflower seeds"? AND I LOVE THOSE UMBRELLAS! Wish we got them here.